Using right Overmolding methods and elements to achieve the prototype of 2K overmolding product can save costs &improve efficiency. 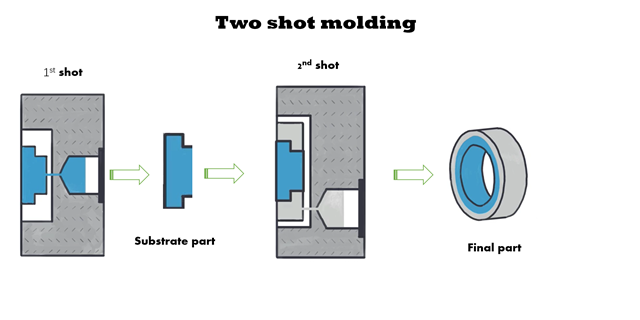 Overmolding is currently one of the most popular and advanced rapid injection molding methods, providing significant potential for saving and new design possibilities for product manufacturing. Thanks to the diversified design advantages of 2K molding products, it has been widely used in various industries, such as mobile phone, pen-making, automobile, home appliance, hand tool, and commodity etc. This article mainly introduces the development and trend of overmolding technology and especially introduces how to realize the prototype manufacturing of small batch in the product development stage for 2K over molding parts. Injection over molding was first used to beautify the appearance of consumer goods, now quite popular. The technology is used in a variety of applications and can even be used to enhance product functionality, such as chemical resistance improvement, lasting grip, softer, more soft touching etc There are mainly 2different types of over molded products. a.Solf material overmolding hardmaterial: The commonly used material in the multiple injection molding is the thermoplastic elastomer (TPE), which is used on the base material (such as ABS, PC, PC/ABS, PA, and SAN). The commonly used TPE is SEBS, TPE-V, TPE-U, TPE-E, and TPE-A. These "soft cladding" products have enhanced functionality such as insulation, chemical resistance, better ergonomics, better handle, grip, and superior aesthetics. b.Hard material overmolding hard material: Another application is secondary molding materials are also hard plastic. For example, rigid plastic with metal insert or transparent rigid plastic with non-transparent parts. Usually, the defect rate of transparent 2K injection molding production is very high will cause great challenges to control process. 2K(two-color) injection molding (formed by two compnents), means that turn a material injection into products on 2K injection molding machine, and then on the 2K machine by mould flipping and jumping to another note in the plastic tube of the corresponding mold cavity. The part is used as inserts, injection on another material to form on the integration of double material products. Injection molding machine is either the double cylinder or double mold cavity, the injection molding process is releasing two kinds of material products at the same time production. Meanwhile, the made product is used as inserts that will be inserted into. Another is two-shot injection molding, means that it makes a material part on an injection molding machine and the material part as an insert into another mold, and then inject the second material. Insert molding (the industry inside name is wrapping, secondary injection molding): during the insert molding, it is first made as rigid part (usually it is a hard plastic part) and embedded into the mold cavity. Following, TPE is used to inject molding on this component, and the complete product is finally obtained. Conventional injection molding equipment can be used for insert molding. The placement of rigid parts can be done by manual or mechanical arms. Usually, the coated metal parts can only be used in this way. Physical method: by buckle design, surface roll, surface tapping, and then the second type of material to achieve the package molding (covering). The characteristic of material bonding purely by this method is that the physical joint has strong adhesion, while the physical joint has little adhesion outside. Chemical method: bond the two materials together by the molecular affinity between two materials and the bond strength of chemical to form a single part, two or more. Although the methods of physical clasp and bonding are often used together in practical applications, it is obvious that realizing the bonding between the two materials is more reliable and more flexible method. This strong chemical bond consists of the mutual solubility, penetration, penetration, and entanglement of molecules or molecular chains. 4. How to produce the best overmolding products? 4.1 Material option: There are mainly 3 key factors affect the molecular level bonding of TPE/hard-plastic material. 3)When TPE melt flows along the hard plastic surface into the mold cavity, heat is released during the cooling process, which can rapidly and effectively melt the hard plastic surface to form a thin interpenetrating layer. 1).2K molding is better than that of two shot molding effect. 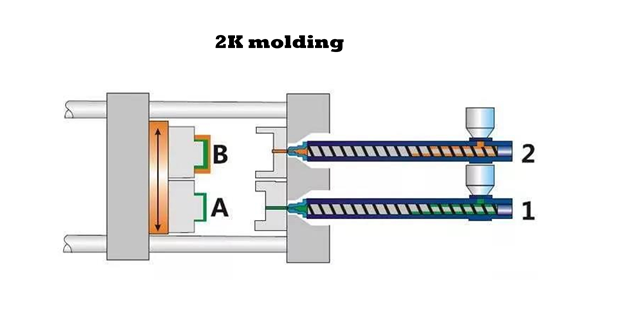 2K mold advantages: The first shot of hard plastic injection molding is still hot, and then it immediately enters the second cavity of 2K injection molding machine. Since there is no moisture absorption during the transfer process; on one hand, it is easy to be ablated by the high-temperature TPE melt on the surface to produce an ultra-thin layer, and on the other hand, there is no effect of water vapor adsorption on the surface. 2)Choose higher feed barrel (melt) temperature as far as possible within the allowable range of TPE material, otherwise, TPE would not have sufficient heat to ablate the surface of hard plastic material. 3)When overmolding the second shot, the mold cavity of hard plastic had better adopt high mold temperature to supply heat energy. 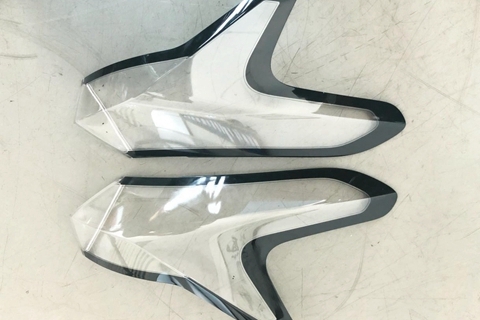 When hard plastics reach high temperature, the TPE high-temperature melt will cool slowly so that have enough heat and time to ablate the hard plastic to form a intersoluble, ultra-thin layer. 4)In the second step of overmolding, TPE melt should be ejected with high shooting speed as fast as possible, under the premise of no TPE flying edge. a. With fast shooting speed, TPE melt has a short spread time on the hard plastic surface, and a longer time to ablate the hard plastic surface during the molding cycle. b. Friction between TPE and hard plastic surface leads to friction and heat generation. Thus, the temperature of TPE melt also cools slowly, with longer time to contact and ablation of the hard plastic surface. c.Due to fast shooting speed, the viscosity of most TPE melt is sheared while becoming thin, which leads to surface tension decreases that is conducive to spreading on the hard plastic surface. 5)Avoid moisture absorption or tarnish on the hard plastic surface, especially in two-shot molding, through the transfer process, this is more likely to occur. 6)Nylon 66, the surface moisture absorption leads to the formation and adsorption of water molecules to form hydrogen bonds, TPE cannot effectively form intermolecular bonds with the hard plastic surface molecules, and the natural bonding strength decreases. Coated polarity hard plastic TPE is certainly also polarity formula, doesn't not pay attention to moistureproof, affect the cohesion effect at the same time. 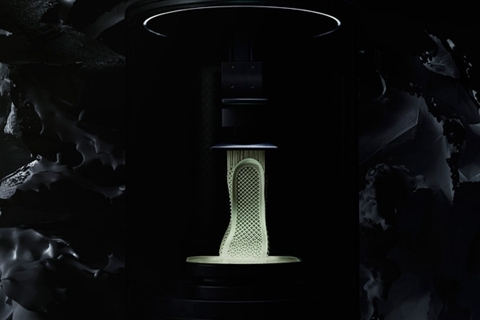 Two-color FDM 3D printers have already existed for a long time. Generally speaking, 3D printing is equiped with two sprinkler heads to print materials of different colors so as to realize the model of two-color mixing. However, there are still great limitations in material selection. Some 3-d printers, while capable of printing multicolor transparent parts, they have a rough construction, low resolution, poor texture and can even be described as "pixelated." Therefore, there is still a long way to go for 3D printing with polychromatic features and appearance prototypes. Urethane casting is a common method for small batch prototyping. 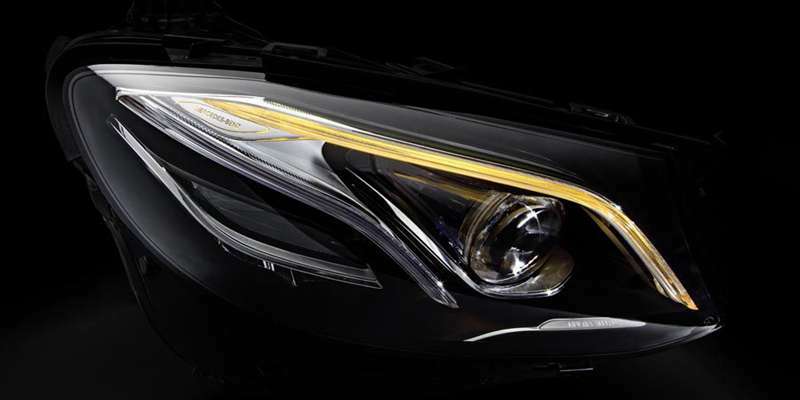 And it has a prominent advantage for overmolding prototypes production. 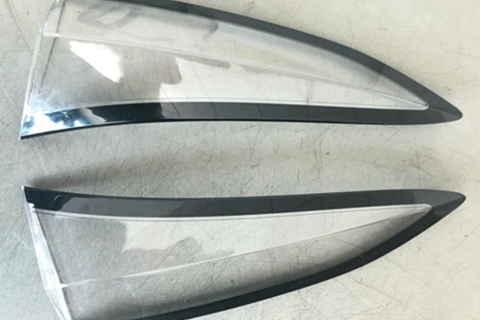 Silicone tool casting part can accurately match clients’ specification, no matter what it refers to color, texture and glossy finish, insert and over molding, or even optically clear. It is great for trial production of parts with complex process structures can directly out of the mold, thus making part easy to get out of the mold, ignoring the need to design the draft angle, providing a standard machining tolerance on ± 0.15mm/100mm, with the highest precision able to reach ± 0.05 mm. the complex structure can be directly out of the mold. In addition, material selection is also abundant, with a wide variety of materials to facilitate the creation of urethane casting parts. Materials with certain properties are similar to production grade plastics such as ABS, PMMA, PC, PP, PA, soft rubber, and include impact resistant, high temperature (120℃) or fire resistant (UL94-V0). Mold making: The process of silicone tool overmolding mainly includes master pattern making, silicone mold making, and vacuum casting. Using silicone mold, we can make many kinds of overmolding products, such as rubber overmolded hard plastic, hard plastic overmolded hard plastic, and transparent overmolded non-transparent plastic. Process control: the location of the gate and the design of the vent hole of the silicon mold is a big difficulty in making the silicone overmolding mold. First, the gate must be positioned away from the appearance surface of the product, and sufficient fluidity is required to allow the material to fill the mold. Secondly, the position and quantity of air vents often need to be adjusted several times, especially when the transparent part is made, the bad air will produce obvious appearance defects. Finally, the shrinkage of the two materials and the deformation during secondary curing. CNC machining 2K prototypes normally will take a lot of post-processing to achieve the two-color or multi-combination of material. Its features are fast speed, with high dimensional accuracy and appearance quality. The option of materials is wide, almost all engineering plastics and metal materials can be processed. After polishing and other surface treatment, the production effect can be comparable with or even higher than the injection molded product. For now, the mainstream prototype manufacturing of overmolding products is still dominated by CNC. Of course, the silicon mold has also made great progress. 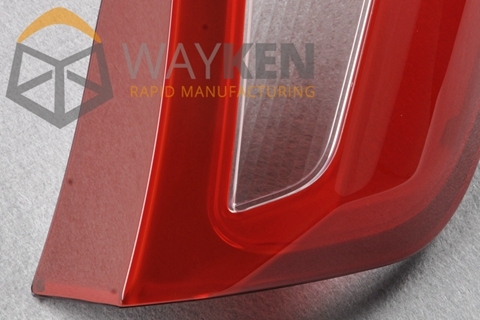 Recently, we have made great progress in the small batch 2K silicone mold of two-color transparent car lamp parts. Usually, the processing of the overmolding prototype is realized by combining CNC and silicone tool overmolding methods. Through the observation of the important international exhibitions in recent years, European and American manufacturers in the field of multi-color injection molding have been promoted to the "combination" presentation of several basic molding technologies. 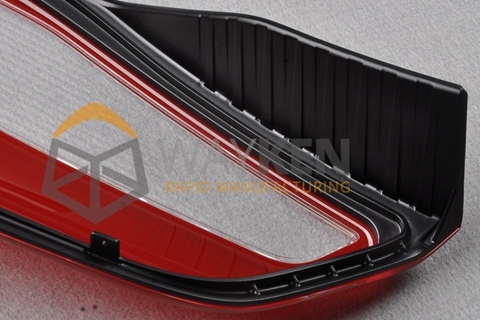 Except the traditional multi-color products, such as automobile headlights, air conditioning panel, TV frame, etc., new application such as two-color moulded internal label (IML), two - color forming within mold composition(IMA), StackMold, 2K+IML+IMA+Stack Mold, two- color molding and interlayer injection, all these new AP can be achieved by only one injection machine. As a result, multicolor injection molding technology is getting more and more attention. What we not only need it to present multicolor technology, but also must combine it with other technologies to create higher efficiency fruits, which is the industry must challenge the goal in the next stage.